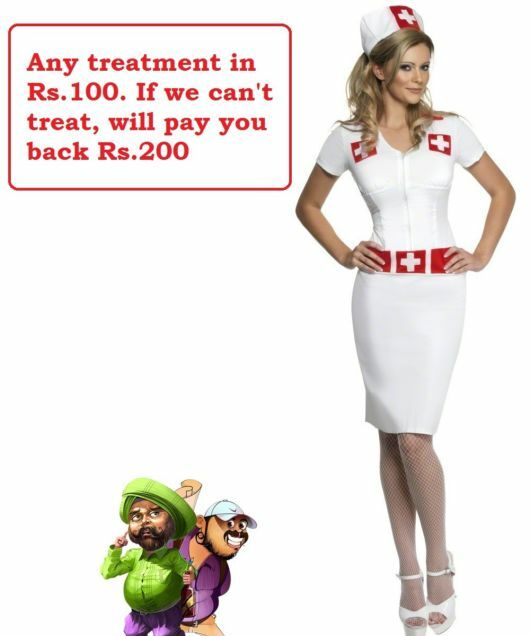 "Any treatment in Rs.100. If we can't treat, will pay you back Rs.200." : "I can't feel any taste on my tongue..."
Santa :- asks the Nurse to put few drops of medicine from box no 22. After that the Banta shouts: "Oh my God its very Bitter." Doctor Santa says congratulations your sense of taste is back now. Banta was angry as he lost Rs.100. After 2 weeks Banta comes back again this time he thinks to get back his previous 100 too. Banta : "Doctor I have lost my memory." Doctor Santa : "Nurse! please put some drops of medicine from Box no 22 on his tongue." Banta : "Wait doctor but that medicine is for sense of taste." Doctor Santa : "Congratulations your memory is back."